Describes special exhibits and collections in the Library. 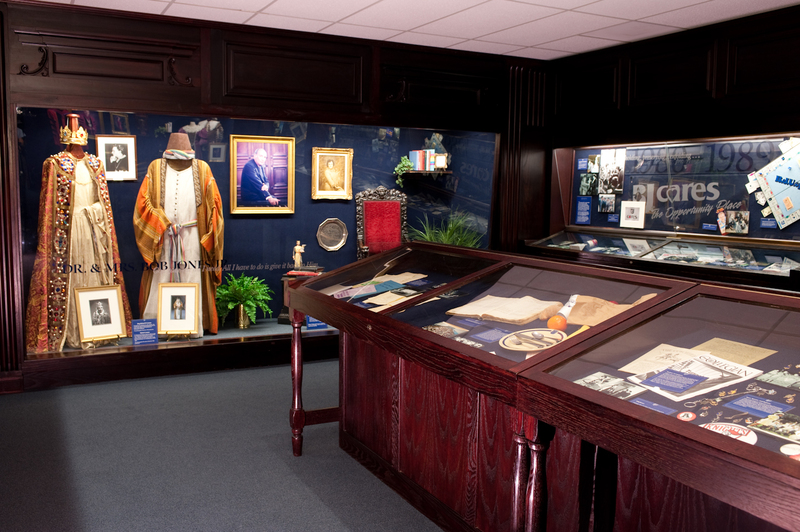 The Archives Memorabilia Room provides a fascinating array of pictures, text, artifacts, and video dealing with the history and heritage of Bob Jones University since the founding in 1927 by Bob Jones Sr. Other items of interest include the Bible of baseball-great-turned-evangelist Billy Sunday as well as one of his baseball cleats. The Jerusalem Chamber is a reproduction of the room in London’s Westminster Abby where part of the King James Version of the Bible were translated and serves as a display area for the University’s collection of rare Bibles including the 1611 and 1613 editions King James Version, the 1608 edition of the Geneva Bible, and the Saur Bible of 1776. 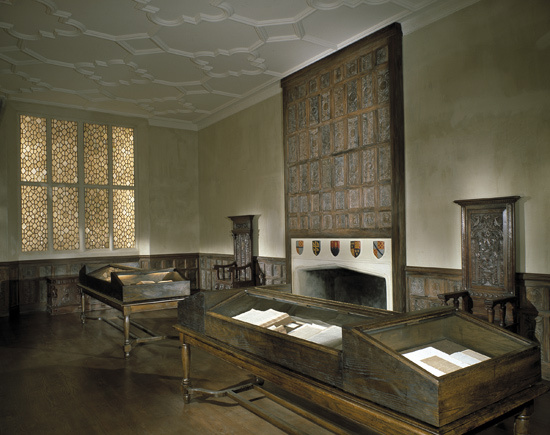 The Jerusalem Chamber is reproduced in the Mack Library with the kind permission of the Dean and the Chapter of Westminster Abbey. Dating from the late 14th century, the Jerusalem Chamber formed part of the lodging of the Abbots of Westminster and probably took its name from the subject of the tapestries originally hung there. It is known to have been remodeled and altered on several occasions. It was originally Gothic in character as is evidenced by the fireplace frontal, which appears to have been a part of the original construction, and by the open high ceiling in the room since its final restoration. Dean Stanley (1864-81) removed the lowered ceiling and paneled the walls with cedar wood brought from Lebanon. He did not, however, remove the carved cedar wood over the mantel. It had been installed by Lord Keeper Williams, Dean of Westminster in the reign of James I, when the room was remodeled to celebrate the betrothal of Charles I, then Prince of Wales, and the French Princess Henrietta Maria (1624). On a visit to the Abbey on the eve of his departure, "while he was making his prayers at St. Edward's Shrine to take there his leave and so speed him on his journey, he became so sick that such as were about him feared that he would have died right there. Wherefore they, for his comfort, bore him into the Abbot's place and laid him down before the fire in his chamber. On coming to himself and learning that he was in the Chamber named Hierusalem, then said the King, 'Laud be to the Father of Heaven! for now I know that I shall die in this chamber, according to the prophecy made of me before said, that I should die in Hierusalem,' and so he made himself ready, and died shortly after." The Jerusalem Chamber was used in 1611 by the translators of the King James Version and by the committees on the Revised Version of 1885 and the New English Bible (New Testament) of 1961. The Upper House of Convocation (Bishops) has frequently met there, and many famous persons have lain in state there. The Chamber has been in constant use for about 600 years. It is, in effect, the official reception room for the Dean of Westminster and therefore is not open to tourists. 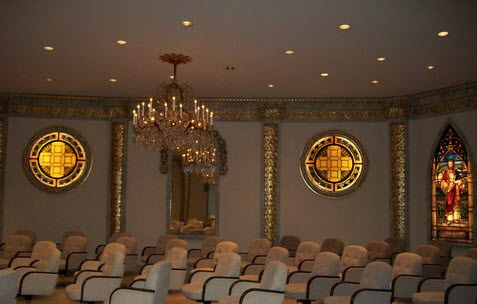 Dixie Baptist Church, Clarkston, Michigan, under the leadership of Dr. Paul Vanaman, pastor, provided the funds for the interior design of this reproduction of the Jerusalem Chamber. Harrell Whittington, a member of the University staff, and Dr. Bob Jones Jr. designed the Tudor ceiling and wall paneling based on their probable appearance in 1611. Mr. Whittington worked out to an exact scale the drawing for the room. Melvin Stratton and John Swaffer, also members of the staff, were responsible for the construction. 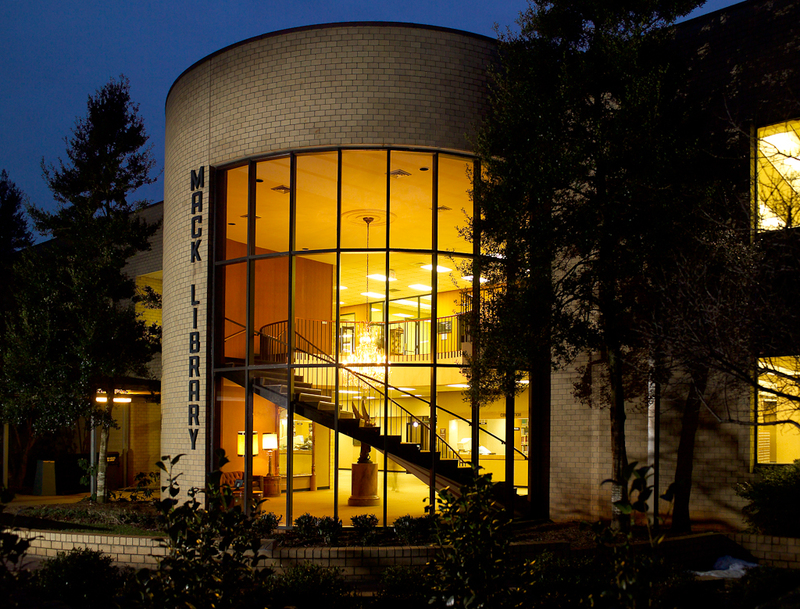 The Mack Library’s special collections include the oldest, rarest, and most fragile books. Among these books are an 11 ft. Hebrew Manuscript from 1410, a hand-written sermon outline from Charles Spurgeon, and the Chronicon pontificum et imperatorum, written by Polonus Martinus in 1310. The collection also contains the American Hymnody Collection featuring 980 hymnals from the mid 18th century and the Greenville Mountaineer, one of the earliest newspapers from the local community. Copies date from 1826-1853. This historic collection traces the development of hymnody in America from colonial days to the present spanning all denominations. The collection consists of hymnals used in the United States, not all of which were published here. Many of the hymnals used in American congregational song were brought here by immigrants. The collection began in 1995 shortly after the University purchased an initial group of older American hymnals and songbooks. Faculty in the Sacred Music department suggested that this could be the beginning of a unique collection to preserve an important part of Christian history and be a resource for the University and scholars. The collection currently numbers about 980 volumes from as early as 1739 through the end of the 20th century with the majority of the volume in the 19th century and spanning all denominations. Donations are welcome to help expand the collection. This collection is housed in the Special Collections room. View a list of the full collection. The room contains a collection of rare Bibles, some of which are on display in the Jerusalem Chamber. See a full list of items from this collection. A generous gift from Mrs. Earle Sargent provided for the construction of the boardroom, which has been designated as a memorial to her late husband, a long-time member of the Board of Trustees of Bob Jones University. In addition to its function as the meeting place for the annual meeting of the board, the room is used for various University departmental meetings. The pilasters with their elaborat e capitals are all hand carved from walnut, as are the over-door pieces. These originally formed part of a large and splendid reception room in the George Blumenthal Mansion in New York. When the mansion was dismantled, the woodwork was acquired by French and Company, the well-known antique dealers, who presented this to Dr. Bob Jones. This woodwork, unattainable at any price today, had been in the University storage for a number of years until the time of its installation in the boardroom. The two long stained glass windows were made in the studios of Lewis Comfort Tiffany about 1900. One depicts Dorcas and the other the apostle Paul, each emphasizing a Christian grace and virtue which Bob Jones University seeks to emulate - the one good works and Christian charity, the other faithfulness in the proclamation of the gospel and and an uncompromising stand for the Bible and its truth. The tapestry depicting a triumphant procession was given to the University by Mr. and Mrs. Monroe R. Meyerson. Prior to being placed in the boardroom, it hung on the mezzanine of the Founder's Memorial Amphitorium. The cast-iron medallions in the front of the desk originally graced a government building in Washington. The revolving pedestal chairs were purchased by the members of the Board of Trustees. The chandeliers in this room were a part of the set of three given by University Board of trustees member W. H. B Simpson and Mrs. Simpson. These originally hung in the ballroom of the old Astor Hotel on Times Square in New York. When the Astor was razed in 1966, the Simpsons acquired them for the Cape Fear Hotel in Wilmington, North Carolina, where they hung until they were brought to Greenville. The third chandelier hangs in the stairwell of the library's main foyer. Harrell Whittington was responsible for the room's design, which was executed by the students and staff of the stage crew under the direction of Melvin Stratton and John Swaffer.